Samsung and SanDisk are looking to one-up each other when it comes to expandable memory for smartphones and any other device that supports a microSD card. SanDisk made a 200GB card last year that is quite affordable, and then Samsung came up with a 256GB model . A few weeks ago, SanDisk matched Samsung’s 256GB card with two new microSD options of its own , both more affordable than Samsung’s card. But Samsung stepped up its game and killed the microSD card completely. The company’s latest memory offering is a UFS 2.0 storage solution that will work with any device that has microSDXC support, but it offers the same lightning-fast storage experience as the Galaxy S6 and Galaxy S7. In fact, these new cards are just as fast as SSD drives. 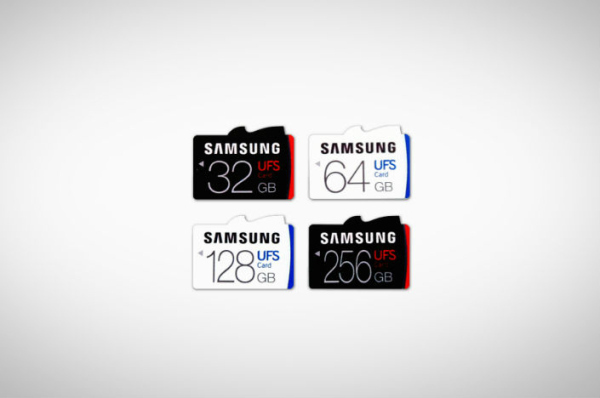 Samsung last year switched to UFS 2.0 storage for high-end mobile devices , with the Galaxy S6 being the first to get these new ultra-fast memory chips. Short for Universal Flash Storage, UFS can significantly improve the smartphone experience, allowing faster access to the contents of a phone. Expanding UFS 2.0 support to swappable cards seems only logical for Samsung, and the move would let diehard Android fans to take advantage of Android’s adoptable storage feature – here’s how to enable it on the Galaxy S7 . Oddly enough, Samsung does not mention Android devices in its press release , saying the new memory card has been designed for “mobile shooting devices such as DSLRs, 3D VR cameras, action cams and drones.” Samsung did not announce actual release dates or pricing details for the UFS 2.0 memory cards either, but it did reveal performance details.